I took Cody up on the offer I had earlier refused, and by the morning we were in the Volvo yelling along to 80’s power ballads on the familiar Hwy 395. 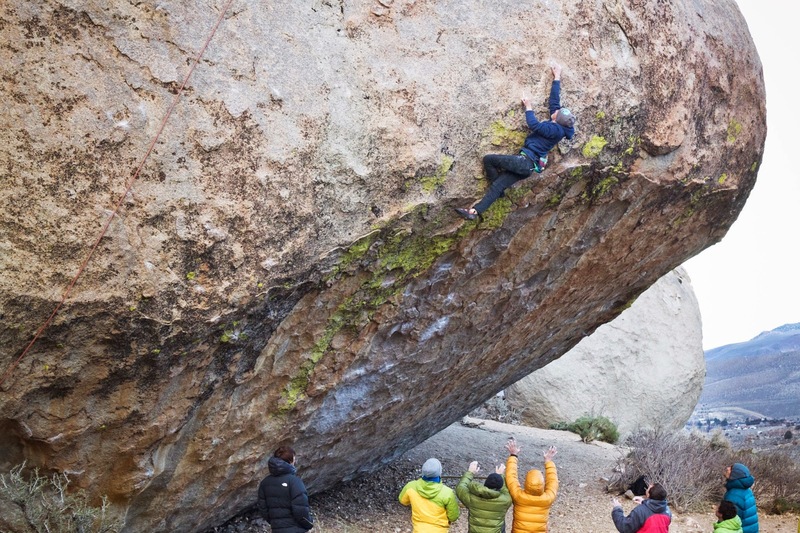 Although my finger was sore and the foreboding weather forecast had me feeling skeptical about the amount of climbing I’d get in, Alex and Jason were Bishop bound and I found it hard to miss out on a reunion. 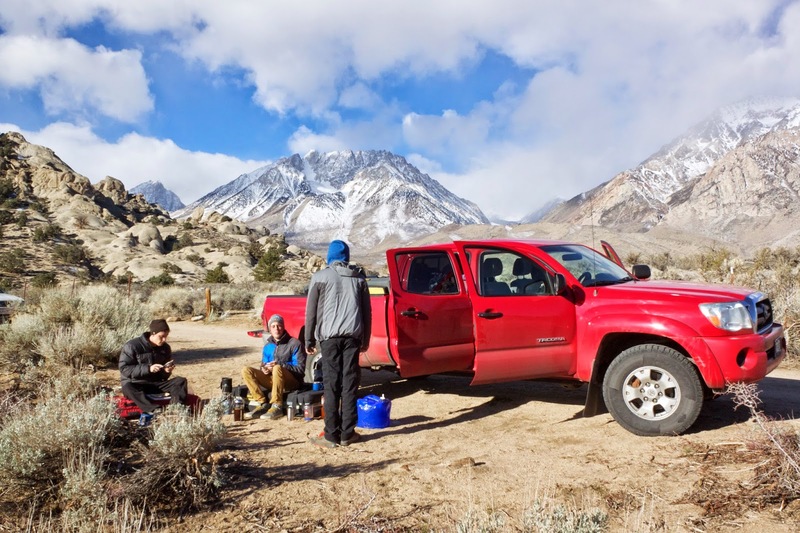 The crew taking a lunch break with a marvelous backdrop. 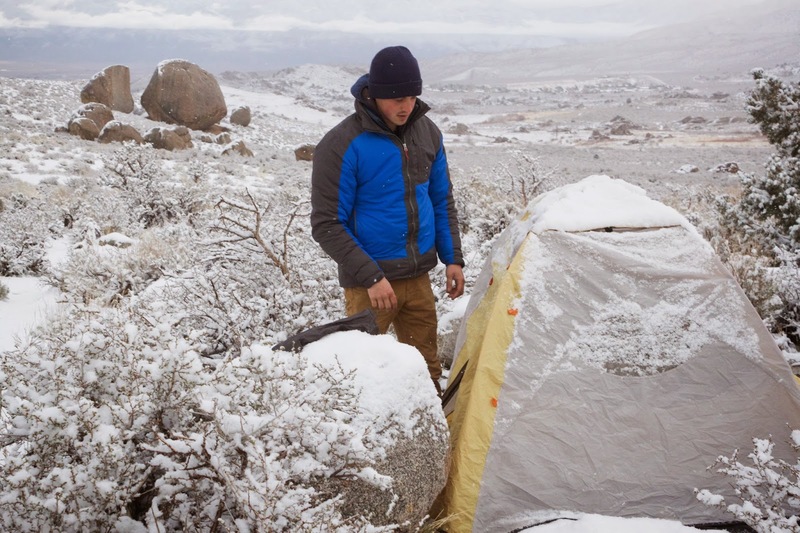 As Cody and I pulled up to the Buttermilks main area the wind began to pick up and the temperature began to drop. The blue skies were disappearing. We ran laps on some slab before heading over to Fly Boy, where both Cody and Shawn made first go sends of the classic. Cody, gaining the upper crimps. Shawn, throwing for the lip. Afterwards, we walked over to the Peabody’s to support Alex on his project. 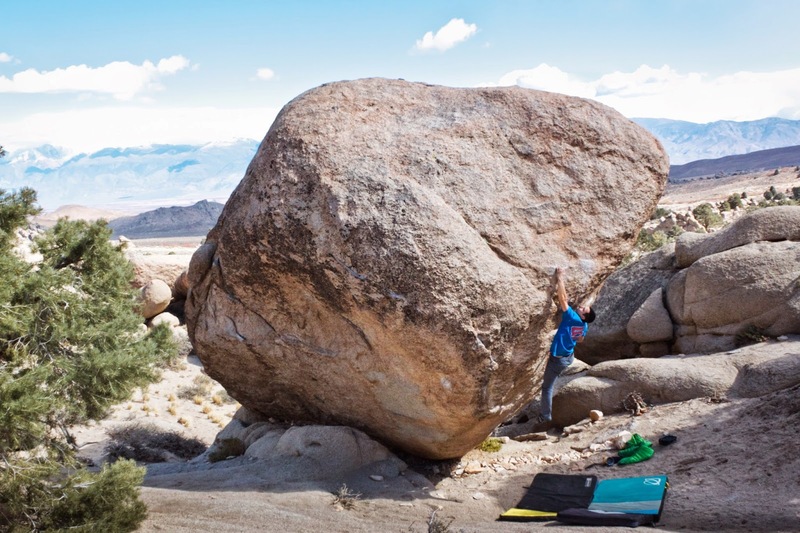 He was chasing his life goal of climbing the bold and beautiful Anthony Lamiche line up the face of the monstrous Grandpa Peabody boulder. 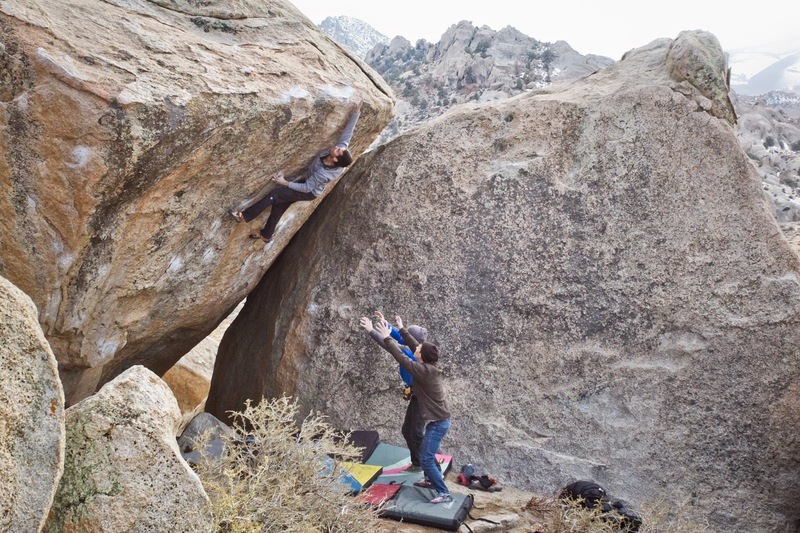 In the guidebook description of the problem, Wills Young suggests to bring all the crashpads in Bishop, and a wheelchair. We managed to gather about 15 pads, which seems like the bare-bones protection for the line. As the temperature continued to drop, an impressive gathering of strong climbers including Alex, Carlo, Giovanni, Vitaly and team Japan, traded attempts committing high off the deck. 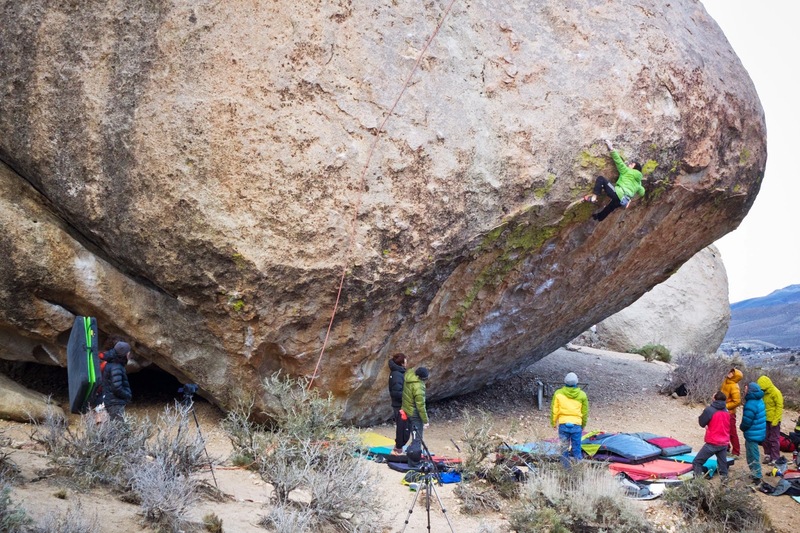 Giovanni Traversi, pulling past the lip on Evilution Direct (V11). I climbed Evilution to the lip and dropped off. My hands were numb from the cold and I could barely tell whether or not I was on the holds. I resorted to spotting and taking photos rather than trying to finish off the direct line. Carlo Traversi, sending one of the proudest lines around. Carlo made a commendable send before the 50-mile an hour gusts of wind, which carried little specks of snow down from Mount Tom, made it nearly impossible to climb. Alex Biale, on the last committing move of his project. 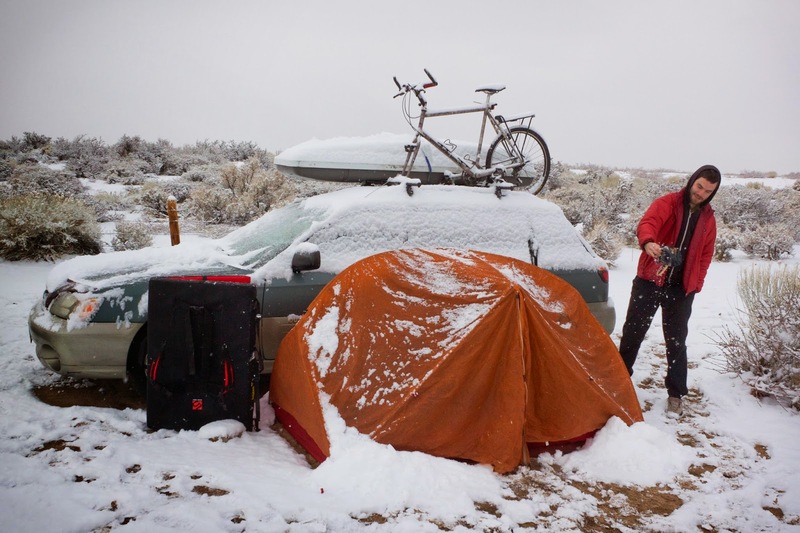 After some valiant efforts and unnerving drops, Alex and the rest of the crew had to call it a night. Meanwhile, just to the left of Evilution, Toru Nakajima was making some of the hardest moves in America look like no big deal. After silently sipping some tea, he nearly sent Lucid Dreaming, wearing socks and capris pants. I scraped my jaw off the ground. What a truly humbling and inspiring climbing session. The next day we climbed some new slabs in the birthday area to warm up before heading over to Solitaire. I sent the classic but had my eyes set on the sit start, which Alex mentioned had broken since he last did it. The consensus is that it now goes at about a grade harder. I figured out the micro-beta, rested and sent. 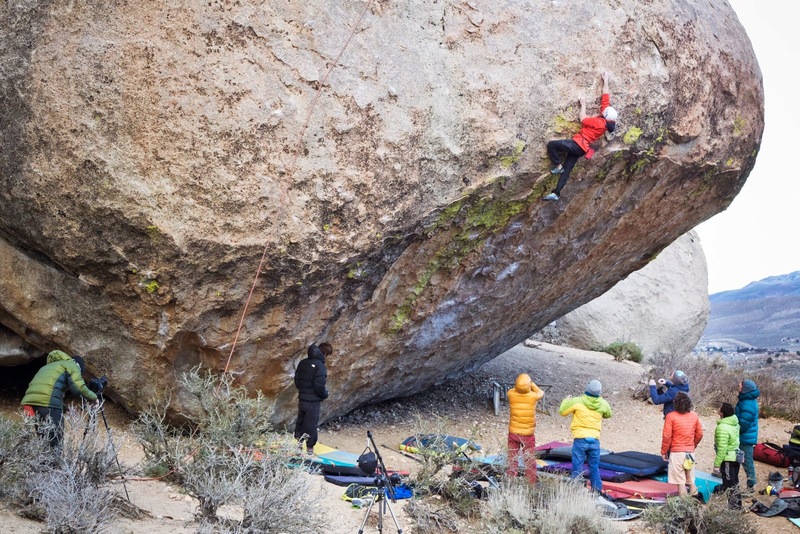 Itai, climbing on the granite campus board Solitaire (V8). Photo by Alex Biale. We returned to the main area and climbed a bit more before heading into town for a much deserved burger and beer. The next morning we woke up to a couple inches of snow on the ground and more coming down. It was time to go home. Alex, with his snow capped project in the background. We all left Bishop with unfinished business, but obviously the trip was still a success. 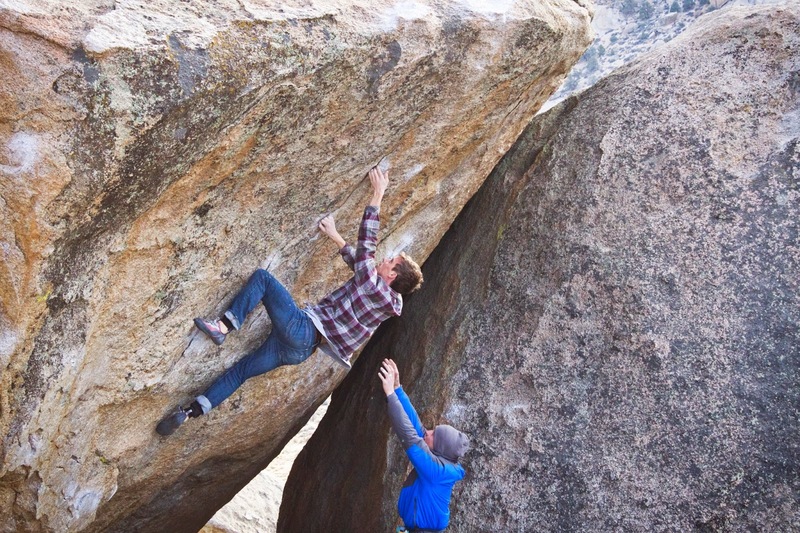 Cody, demonstrating the benefits of a weekend in the mountains with good friends and good climbing. As always, I can’t wait to go back.